Quickjack car lift - opinions? › Quickjack car lift - opinions? 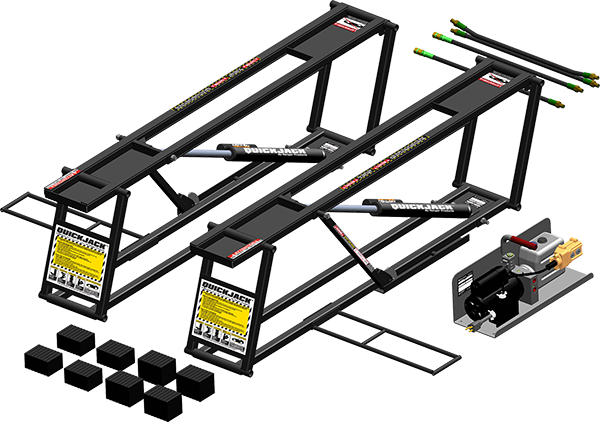 Has anyone got or used one of these car lifts by Quickjack? If so what do you reckon? What size is the correct one for our cars - the 70" or 75" frame length? (5000lb weight would be fine I'm sure). Seems to be quite a good system from the reviews I've read in general and from you tube video's. Price is reasonable, it's quick to actually use and, with the rubber blocks, gives almost 2 feet of lift height for working under the car. What makes it appeal especially is that there would be open access underneath the car, no bits getting in the way like there is with most other similar lift systems. I've already got ramps, axle stands and trolley jacks but set up time and, more importantly, the clearance is not so great for a car this low. Wish I could get a 2 post lift but space means that's not gonna happen sadly. I did not have space limits in my garage so I have a 10,000 lb. two post Danmar lift. There price was great and three year warranty. I put it up by myself using a engine hoist. Had to rent concrete drill only too 30 min. to drill all the holes. They do make compact versions of two post that can be moved also. Here is a link to where I bought mine. They have lots of different brands. Cheers. Yes that certainly looks more sturdy. I'm really after an open centre lift though. I'll keep looking. When the QuickJack Portable Car Lift is used according to our instructions (vehicle frame’s lifting points properly engaged, weight capacity not exceeded, etc.) the lift is safer and more stable than any jack stand on the market. In fact, QuickJack has been awarded EC-Type Examination Certificate. Safety systems, strength-of-design, manufacturing quality and electrical compliance are just a few things that these third-part testing laboratories investigate rigorously before awarding certification. (11-22-2018, 12:20 PM)Carolina_Mountain_Mustangs Wrote: Not familiar with them. Thanks David. I've had a look but, with the room I have in the barn, and the rough concrete floor that it has (itself on a bed of clay - no proper foundations at all in older houses in France!) they wouldn't be suitable either I'm afraid. I've come across some other open centre, scissor jack type lifts, much more sturdy but the weight of them is like 500kg, therefore not really portable so I'd have to regard them as fixed. Which would mean having to drive over them every time I took the car out and put it back. Yes space is at a premium! Thanks mudbilly. Yes the specs do seem more than sufficient for these cars, with over a tonne of spare lifting capacity. They are quite light really at 100kg so plenty portable at least. One thing to look for in a lift is if it has been certified. It is not a requirement to pass a certification and before I bought one was viewing video online. Some of the cheap lifts that were not certified would fold up when they tested them to the max capacity. In my mfg. background most testing of products I was involved with went to double the rated capacity. One that I remember was at John Deere for the Gator vehicles. We were working on a new design for the bed and they advertise 1,000 lbs. capacity but when testing put 2,000 lbs. in. People always overload their equipment. I have probably hauled 4 or 5 times the limit in my Ford P.U.. The lifts do not seem to have lots of over build in them and for sure the one's that are not tested I would not purchase at all. This is link to the people that do the certifications in the U.S.. Like I say not required but if it has this seal then good to go for rated capacity.